Have you heard of the Institutional Risk Analytics (IRA)? No it’s not a terrorist or a militant group, though their techniques are similar. 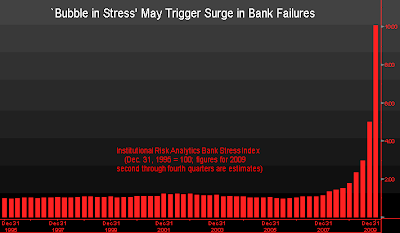 It’s yet another research group that has jumped on the bank stress testing bandwagon. Let’s spook the world to get ourselves into the press – sounds familiar? They are known for publishing the IRA Bank Stress Index. It does sound scary, particularly if you look at this graph – projected to the end of 09. Wow! "At the current rate of deterioration, that could put the Stress Score for the entire industry over 10 by Q4 2009 or a full order of magnitude above the 1995 baseline. Such a worst case scenario suggests that we could see one in four US banks merged or resolved through the cycle. In the event, that suggests that over 2,000 institutions, large and small, will be resolved. Put that into context with the FDIC's "official" dead pool of 300 or so institutions and that gives you a tangible measure for how much "spin" might live within the official version of the problems facing the US banking industry. " Let's all buy guns and move to Canada. A bit of a downward migration from A+, but nothing to indicate a major shift. Yes, some weaker banks have been taken out by FDIC (Ds and Fs) and the large banks got government capital, but it by no means looks cataclysmic. We all know the official picture is rosier than reality and more regional banks will fail and get rescued. But this reeks of sensationalism with a bunch of fluff and jargon. Prove us wrong.